The town of Swindon, England, will provide free Wi-Fi to residents: The project is estimated at just £1m to install 1,400 access points around the city, which seems rather inexpensive--could that possibly include installation, backhaul, network operations, and bandwidth? The network is described as a mesh, but it's hard to know what that means these days, as the term is used too loosely. Usage will be limited on the free service, but that hasn't been described in any of the reporting. An hour a day? 100 MB a month? A 20 Mbps (noted as 20 MB in the Guardian story) service will be available as an upgrade, but I don't know of any Wi-Fi network capable of delivering 20 Mbps on a distributed basis. 20 Mbps is tricky enough in the home over any distance. Color me dubious about the particulars. The Web site for the service, dubbed Signal, is unpopulated. International coverage of this story is breathless, quotes from the press release, and doesn't ask anyone from the company or elsewhere about how this could possibly work. At least the firm plans to use WPA encryption, according to its press release. The company also recommends using a "wireless" repeater, which means there's a hidden $50 to $150 cost in obtaining such an item to pull the signal in from outside. The network will apparently be up and running by April 2010, with an initial phase launched in December 2009. Funds will be used from both public and private sources, and a local businessman's firm, Digital City UK, will handle the buildout. The Swindon town council owns 35 percent of the venture. I don't see how the stated goals, costs, deployment, and service is feasible. I'm looking forward to further details. The clever bit here, and how Meraki may succeed where EarthLink failed, is that the firm is relying on individuals and businesses to choose to opt in, site equipment, and take advantage of the network working better for everyone because they participate (paging Ayn Rand). Meraki plans to offer solar-powered outdoor nodes for extending the network's reach, which means potential locations don't have to provide electricity on rooftops or elsewhere, which in turn means fewer or no layers of approval from anyone in authority (whether a neighborhood association, landlord, or the city). "It's relatively easy to install on private rooftops," said Meraki CEO and co-founder Sanjit Biswas in a briefing earlier today. In the process, Meraki gets a city-wide testbed for local search, local ads, and new technology. "The great thing about having a real-world testbed is you can see the performance," Biswas said. Meraki is testing advertising now, but Biswas says it's "very much in the test mode." While Biswas didn't disclose any of the costs of building the city-wide San Francisco network or its recurring bandwidth bill for backhaul--he told the AP "a few million"--the math works for Meraki. Giving away 10,000 to 15,000 nodes that cost them as little as $25 assembled for indoor nodes and a few hundred for outdoor nodes with solar chargers and batteries doesn't add up to a lot. They don't have to negotiate pole rates, handle installation, or pay recurring venue fees. Bandwidth is relatively cheap if you can choose the points at which you inject it, which Meraki will be able to do. Update: I misunderstood the backbone part. 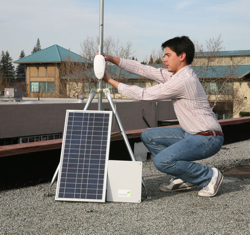 Meraki will, in fact, install some hundreds of solar-powered outdoor nodes to run the backhaul; but they'll still be working with people to find those locations rather than securing those rooftops themselves. Meraki has learned quite a lot about the real world, Biswas said, with their current San Francisco network, having identified 20,000 interferers--other devices within range and frequency of Meraki nodes--within the 2 sq mi area. Meraki nodes use a centralized intelligence to control routing, as well as a modification to Wi-Fi that doesn't affect end users' ability to connect, but does allow clusters of routers to act dynamically as a unit. With unmodified mesh Wi-Fi networks, all devices within range of one another and on the same channel act in concert, reducing flexibility and throughput; smaller clusters produce better results. Further, most of the metro-scale Wi-Fi devices sold by Tropos and others are designed to put out the highest possible power output; Meraki uses generally low-power equipment. It's ants versus elephants, with ants being able to change course a bit more quickly. "It's kind of a brains over brawns approach. It's really because we have so many radios," said Biswas, that their network is more flexible. "We can set routes and load balance appropriately to get the maximum performance out of the network," Biswas said. The current San Francisco network has seen 40,000 unique devices so far--there's no registration, so each unique adapter number is counted--and moved over 10 terabytes of data. Of those 40,000 devices, 1,000 were iPhones. Biswas said that Meraki has discovered its biggest market may be developing countries where there's an established user base for the Internet that's limited to dial up or slow-speed broadband, and where carriers could deploy Meraki gear to get around non-existent copper infrastructure. "A lot of our largest customers are carriers that are entering markets in Brazil and India," he said. "We're not at this point going after the most remote villages in the world; there are some very dense populations who...would love to use broadband but just can't get it." Meraki's inexpensive mesh-routing nodes are a hit: About 15,000 users are connecting to their $50 nodes ($100 for outdoor units) in 25 countries during their testing phase. The company didn't note how many routers were shipped, but it's likely between 1,000 and 2,000 based on their descriptions of density. Meraki's devices cost a tiny fraction of what metro-scale mesh networking equipment costs, and that's partly because they have fewer features and reach much shorter distances, requiring denser installations. But the point isn't necessarily blanketing a city, but rather putting a signal over a neighborhood, a village, or an apartment building. Meraki is a bit like powerline networking: Covering connected areas without a lot of infrastructure. You can listen to an archived podcast interview I conducted in Oct. 2006 with Sanjit Biswas and Hans Robertson, two of the co-founders. Finally, Meraki announced $5m in first-round funding led by Sequoia; other investors weren't noted. GigaOm mentions that Google and Sequoia invested in Fon; Sequoia in Ruckus Wireless; and Benchmark Capital in Whisher. Two of the wave of newer metro-scale wireless equipment firms release news on deployments: Wavion, InspiAir, Go Networks, and Cohda Wireless are in the wave of startup vendors that came in being after BelAir, SkyPilot, Strix, and Tropos became established (but still startup) players. (Cisco and Motorola may have acquired and built metro-scale and mesh technology, but they're hardly startups.) These firms all employ techniques to allow greater range and greater spatial reuse of frequencies than the established players, typically via multiple antennas to allow beamforming and/or spatial multiplexing (unique data streams that follow disparate spatial paths using the same frequencies). Wavion notes today that CONNX, a Maryland network operator, will deploy 120 of their APs. Their AllCoNet (Alleghany County Network)is one of the earliest municipal wireless networks, and the organization did rigorous testing of a host of mesh and metro-scale devices. The group claims that just 12 Wavion devices (with six transceivers and six antennas) cover a square mile. In most competing deployments, 25 to 50 APs are recommended, according to my many sources on this matter. Wavion has said in the past that they plan to add SDMA, a method of beamforming a signal to specific clients in such a way that other clients on the same frequencies receive nearly zero energy, enabling simultaneous reuse of frequencies over space. That SDMA mode isn't yet out, and some engineers I've spoken to think that the current Wi-Fi MAC can't accommodate this mode. Wavion has acknowledged it's a challenge, but they believe it's got a solution. Meanwhile, InspiAir, a company that boasts in its press release that it violates people's notions of the laws of physics, has formally unveiled a network covering Helsinki, Finland's central core. The network was biult with local firm Omni-Directional Communication Products (OCP). The firm says they've monkeyed with standard Wi-Fi to support dramatically higher areas of coverage with good throughput. The press announcement says only 14 access points were required to cover the area in question, the size of which isn't defined, and thus that number provides no guidance in comparison to other systems. Update: Esme Vos has the details: It's a 4 sq. km (1.5 sq. mi) installation, but they told her only 2 APs are being used; their press release distinctly says 14. They also told her indoor coverage was hit or miss. If you're not attempting full indoor coverage, their competitors would also recommend a lower range of APs per square mile. They note their APs use 60-degree sectorized antennas, offering 1.6 km reach in near-line-of-sight (nLOS) positioning. Their network operates at high 802.11b speeds--they suggest 6 Mbps--with fast 5 to 7 millisecond handoffs for mobile users. Service will run about €2 ($2.70) per day and €15 ($20) per month. Interesting column by UK Wi-Fi gadfly--say that three times fast--Guy Kewney, pointing out a competitive technology to Tropos's new approach: Kewney thinks I was too broad in stating that all Tropos competitors choose to use 5 GHz for backhaul only, where Tropos's new metro-scale mesh system will use 5 GHz as an alternative mesh routing path with dual-radio nodes. He writes that LocustWorld, in operation since 2002, offers similar mesh-over-multiple-radio technologies. And that the firm is ignored because they don't really sell hardware or software; they develop software for reference platforms and sell consulting services. Because LocustWorld doesn't have salespeople or an obvious US presence in the market--because they're not per se selling a product--I haven't seen any comparisons with their software running on commodity devices against commercial, expensive gear sold by Tropos, BelAir, and others. I don't know whether their approach has been considered by any of the major operators now in the US market. MobilePro has chosen to use Strix gear, EarthLink picked Tropos and Motorola, and MetroFi has stuck with SkyPilot. It's worth noting that both the commodity devices and the multi-thousand-dollar, multi-radio proprietary hardware mostly use Atheros chips. That's right. The heart is the same. Tropos's VP of engineering Saar Gillai said in an interview earlier in the week that Tropos has put significant effort into building their own radio boards around Atheros chips, while, he asserted, their competitors typically purchase prefab reference design-based boards that Gillai says vary in performance from board to board. If you look at Defacto Wireless, a partner of LocustWorld that sells Atheros-based mesh nodes in the US that will run LocustWorld's software, they offer single-radio ruggedized external nodes for $700 to $800, which is about a fifth of the list price of a Tropos single-radio node, which Inc. magazine said retails for $3,500. RoamAD from New Zealand also offers software for fungible Wi-Fi boxes, although they charge license fees for it. Martyn Levy, RoamAD's CEO, told me recently that their mesh approach allows their value-added integrators to choose the best set of Atheros-based hardware, manufacture or purchase it in whatever quantities they want to negotiate, and then install RoamAD's routing gear. I'll be curious if someone performs the testing necessary to see how RoamAD and LocustWorld stand up to their much-more expensive, proprietary hardware brethren. I have been told by RoamAD and LocustWorld seems to maintain that a large number of nodes using their respective software have been installed worldwide. But no significant metro-scale operation in the US has been built on either platform, and we're living in the crucible of municipal Wi-Fi right now. RoamAD has a large installation in downtown Perth that's focused on three-dimensional (i.e., tall building) mesh networking, but it's only 20 blocks. Bigger networks are in the works, but not yet announced. Tropos has chosen to upgrade its MetroMesh operating system to support mesh routing across bands. The company said in a wide-ranging interview that their new approach will choose the most efficient route to move packets among clusters of mesh nodes. In an extreme example, if the user-facing 2.4 GHz Wi-Fi network is busy, then Tropos routers would move all intra-nodal traffic to 5 GHz hops; more typically, however, any given packet will transit over the least loaded connection, which could be hopping among a combination of 2.4 GHz and 5 GHz links. Their first two-radio router doesn't solve the problem of backhaul, and will still require an capacity injection connection to equipment like that from Alvarion or Motorola, which Tropos points out is typically substantially less expensive than a mesh node. Saar Gillai, vice president of engineering, said Tropos approached the multi-radio problem differently than their competitors, because there's a high cost in "closing" 5 GHz links--or providing full coverage in every part of a network. Tropos has opted for omnidirectional 5 GHz antennas, which dramatically reduces a 5 GHz radio's potential range, but fits in neatly with Tropos' desire to distribute traffic across a cluster of nodes. In some clusters, 5 GHz radios will only cover 50 to 80 percent of the same area that 2.4 GHz radios cover. This approach allows less dense areas to use single-radio routers and more densely deployed areas to employ dual-radio routers, rather than requiring every device have at least two radios. (Clusters could number from about three to eight units in which the 2.4 GHz and 5.8 GHz radios are using the same channels.) Tropos says this helps them maintain a cost advantage over competitors. Tropos says that they can increase capacity 50 percent above their current levels with the same density of access points as they currently recommend for single-radio deployment. This gives them 50-percent closure, as they describe it, meaning that their 5 GHz links will only cover about 50 percent of the area. For a 20 to 30 percent higher cost, they suggest they could reach 80-percent closure, and nearly twice the capacity of their existing gear. Bert Williams, senior director of marketing, said that deployment costs would be less because each 5 GHz radio wouldn't require alignment with other radios, as in point-to-multipoint systems, and adding capacity could involve simply upgrading their single-radio unit to a dual-radio model rather than building a new backhaul topology. The first hardware version of this technology in Tropos routers appears in model 5320, which supplements the existing single-radio 5210. Gillai said, "This is completely transparent to the users. You can add these routers to an existing network, or you can add these routers to a new network" as existing single-radio routers can receive software upgrades. He also said that existing networks under construction using Tropos gear would not see a shift in orders-in-progress, and that their partners had been aware for some time of the features and timetable of the new routers. Newer routers could replace existing ones in areas of congestion, although Tropos expects that busy areas would involve a denser deployment and dual-radio routers. Tropos competitors--all of them--use a second band primarily as capacity injection, or the layer at which traffic from the user-facing radio in 2.4 GHz is offloaded to aggregated backhaul through point-to-multipoint connections. Now BelAir will say that they use intelligent switching in 5 GHz when they have two or more 5 GHz radios in a single box, and that's just fine. Strix has similar statements. SkyPilot uses extremely high-gain antennas to create point-to-point limits that are isolated in frequency and time from adjacent networks. In their competitors' models, this allows substantially greater density at lower power of Wi-Fi nodes on nonoverlapping channels to provide a lot more bandwidth per square mile; a true mesh network like Tropos's requires all radios on the same channels, and thus you can only shrink or grow the area of a cluster of nodes (or reduce the number of nodes in a cluster) to improve bandwidth. However, the cost is prohibitive for high densities in any of the currently envisioned metro-scale projects using non-Tropos gear because each competing radio includes at least one 5 GHz radio for backhaul--what Tropos has described as the "5 GHz tax." This makes it difficult for competitors' advantage in a honeycombed Wi-Fi deployment to be expressed in the marketplace. What Tropos is saying with their multi-radio approach is that 2.4 GHz is typically not fully loaded at any given time and that 5 GHz isn't just a directionally appropriate band. Rather, they're trying to combine the best attributes of mesh networking--closely placed nodes with frequency reuse in which the best node responds with the strongest necessary signal to a client--with the advantages of routing across dissimilar networks. The real question is whether in the field this amounts to the performance advantage that they cite, and whether the increased cost of their new units is justified by that advantage. Tropos stated that their new 5320 would cost about 30 to 40 percent above their single radio units' cost, or more than 30 percent less than their competitors' two-radio units. It is nearly impossible to obtain pricing for metro-scale equipment--Tropos declined to provide dollar figures--and bulk orders and special partnerships also skew the numbers. Tropos also claimed in a briefing that their competitors substantially undercut equipment prices or even give equipment away to have a lower bid than Tropos-based projects. The 5320 will ship in October, and the company expects versions with other technology, such as 4.9 GHz public safety band radios, to ship within the year. Future devices could include their own backhaul radios with directional antennas, too, and the company is watching MIMO closely as a tool to improve coverage areas. They are also watching WiMax, both fixed and mobile, to see whether there's enough service appearing in the market to offer either a client radio for backhaul or a base station radio as part of a mesh. A Champaign-Urbana-based group gets $500K from the National Science Foundation: The Champaign-Urbana Community Wireless Network (CuWIN) group in conjunction with the University of Urbana-Champaign (UIUC) will use the grant to continue to develop their open-source mesh routing protocol system over the three-year life of the grant. The group wants to produce software that creates self-configuring, self-healing mesh networks with advanced properties that would allow clusters of nodes in which some cannot hear all others can still function with a high degree of reliability. Tropos releases a software update for its mesh-networking hardware designed to improve interaction with handheld devices: The company said in a briefing earlier this week that Adaptive Mesh Connectivity Engine (AMCE) tweaks the mesh nodes' approach to dealing with different end-user devices on a packet-by-packet basis without any changes in the client hardware or software. Each packet, Tropos said, can have a different power output level, and can be customized with specific timing and framing characteristics that work best for a given device. The software is available today to Tropos users with support contracts. No hardware changes are needed. The software also mitigates interference by analyzing the radio frequency noise floor and working around that to better "hear" incoming traffic and produce a usable outgoing signal of the right strength. Later this year, Tropos will release an update that will use another bag of tricks--some of which I have heard of being deployed in enterprise-scale wireless LAN switched networks--that can force clients to associate with particular nodes rather than allowing the client its choice. While this is a hard-wired MAC (Media Access Control) issue that is very dependent on a particular implementation of 802.11 on the client, there are ways that access points can be clever enough to fool the adapter and make it stay put instead of hopping among multiple choices. Earlier this year, Tropos released a set of extensions (TMCX) for customer premises equipment (CPE) device makers that would allow the CPE to talk to nodes and negotiate parameters and pass reporting and provisioning information. AMCE doesn't require CPE coordination to produce benefits, Tropos executives said, but rather reduces client variability on the network side by adapting to the Wi-Fi client's needs. The HotZone Duo comes with one or two radios: The new products compete both against Tropos and BelAir's single-radio mesh nodes, and against BelAir, Cisco, SkyPilot, and Strix's two-plus radio products that offload backbone traffic through switched, mesh, or point-to-multipoint links. A few months ago, the Motomesh division head told me that residential use of metro-scale Wi-Fi couldn't compete against wired service, and was emphasizing the loss in single-radio hopping as packets were rebroadcast over clusters. But, just as BelAir told me that they had to release a single-radio product to compete against Tropos for price and market niche, I imagine that Motorola wants to sell two-radio solutions that conform to their vision of metro-scale service. These new products put them somewhat at odds with Tropos, which has been paired with Motorola's Canopy gear as backhaul for their clusters. In the Tropos configuration, a few mesh nodes, typically 4 to 6, are paired with a Canopy radio that uses WiMax point-to-multipoint aggregation to base stations that then in turn use license, high-frequency wireless to further aggregate to fiber points of presence and network operation centers. Now, Motorola can sell an end-to-end solution, coupled with their existing multi-radio public-safety oriented system that uses both 2.4 GHz and the 4.9 GHz public safety band. EarthLink contracted with Motorola as their service firm, meaning a division of Motorola handles integrating and maintaining all the technology for the metro-scale operations that will roll out in Anaheim (launching in a few days) and Philadelphia (test network due later this year). EarthLink committed months ago to Tropos and Motorola Canopy for its first five cities. Tropos knew the writing was on the wall, which is why they now also have a partnership with Alvarion, one of the leading WiMax firms, with a history of broadband wireless gear dating back to the mid-90s. Phil Belanger is responsible for Wi-Fi: Not solely, but he's one of the most veteran among industry veterans, and was involved in picking its name. (Note: Wi-Fi really doesn't stand for wireless fidelity or anything at all. Ask Phil.) He co-wrote a document that formed the basis of 802.11, helped found the Wi-Fi Alliance, and served as its first chair. He's worked for many Wi-Fi related firms, including Wayport, Vivato, and BelAir. He recently amicably left BelAir after a decade on Internet time working on startups. As a result, he has been able to catch his breath and reflect a bit. Phil offers this two-page commentary (downloadable in PDF form) on the future of IEEE 802.11s, the in-progress mesh standards task group. Phil maintains that 802.11s will have little impact on outdoor mesh deployments, and that its real utility will be in providing a basis for home devices to intercommunicate and relay data--every client will be an access point with no extra configuration or fuss, in contrast to Wireless Distribution System (WDS), which is a relatively undocumented and variably supported element found in the original 802.11b spec. Phil notes that more mesh in the house means less signal power is needed, allowing more spectrum reuse and less interference among devices and neighbors. The 802.11s standard for mesh networking coalesced last week: Two leading groups with separate proposals, instead of slugging it out for a year or two, asked for and were given permission to attempt to merge into a joint proposal in January. At last week's IEEE meeting, the joint proposal was unanimously confirmed as the basis on which to proceed. What this means is that within a year, there could be a unified standard that mesh devices could conform to for interoperability. I wrote in the Economist this week about one risk to municipal networks' early adoption was that at least four major metro-scale mesh equipment vendors are still categorized as startups. A shutdown or change in direction could leave superannuated equipment scattered like Metricom's or Vivato's. A standard at least moves towards the potential of a trade group emerging that could set profiles--a la WiMax Forum--for kinds of mesh behavior. There could be single radio, switched multiple radio, contention-free sectorized mesh, and other profiles probably designed by frequency (2.4 GHz, 4.9 GHz, and 5 GHz); it's unlikely there would be a one-size-fits-all. Standards open industries to additional competition, but they can also soothe worried purchasers.